OMEGA’s PGUF series liquid fillable utility gauges are designed for a wide range of applications on pumps, compressors, hydraulic systems, machine tools and petrochemical processing equipment. For high shock and vibration applications the PGUF can be liquid filled in the field to dampen the gauge pointer movement. The PGUF Series liquid filled gauges come in ranges of (PSI/BAR) 0-30/2, 60/4, 100/7, 160/11, 300/20, 600/40 and 1000/70 (63 mm (2½") gauge is also available in 2000/140 and 3000/200). Rated accuracy is ±2.5% of span. Gauges feature a corrosion resistant 304 stainless steel case and ring, and a durable polycarbonate window. Phosphor bronze bourdon tubes with brass movement, socket and NPT connections are standard. 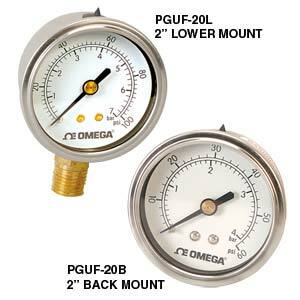 PGUF gauges are available in 38 mm (1½"), 50 mm (2") and 63 mm (2½") designs with center back or lower mount NPT connections. 注: 2000 PSI/140 BAR and 3000 PSI/200 BAR ranges are only available on 2 1/2" (63 mm) dial sizes.